Over one thousand Cambridge staff began protesting their pension reforms today, joined by students in rallies and teach-outs, and on picket lines. Today marks the start of 14 days of industrial action by lecturers, who are protesting against pension changes proposed by Universities UK (UUK). Picket lines formed at several sites around Cambridge this morning, including New Museums, Sidgwick, and Downing. Her sentiments were echoed by CUSU Women’s Officer Lola Olufemi, who told students: “When we look back at this moment, we will know that we were not complicit”. Following the rally, students then marched along King’s Parade, throwing colour bombs into the crowd on their way to Sidgwick site. In lecture sites across the university, UCU members handed out flyers, imploring students going to lectures not to enter their faculty and confronting lecturers as to why they were not participating in strike action. As 10am lectures drew to a close, a group of eight lecturers not on strike were spotted walking in a group past their colleagues. The University of Cambridge Department of Human Resources sent a letter to staff prior to the strikes, requesting staff to advise their “departmental administrator, secretary of faculty board, or equivalent” if they planned to strike. It threatened to “withhold pay at the full daily rate” if academics refuse to reschedule lectures and classes cancelled due to the strike, although the option to reschedule cancelled classes could undermine the effectiveness of the strike. 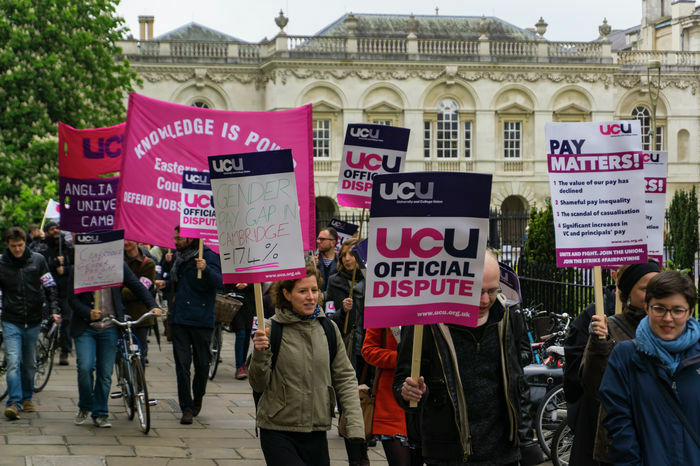 Speaking to Varsity, Cambridge UCU Secretary Waseem Yaqoob spoke about the strikes’ effects on students: “None of us – lecturers, support staff, librarians – want to disrupt [students’] education, but really feel like this is our last resort”. Commenting on the long-term effects of pension changes which spurred strike action, Dr. Matthias Landgraf, an academic in the Department of Zoology, said the reforms would “deeply [affect] the future of education”. Landgraf continued, “The students of today who will be the lecturers of tomorrow – they will feel the biggest impact”. Although many attended lectures by academics not participating in the strike this morning, several hundreds of students gathered outside Senate House in solidarity with the striking staff, many carrying banners and standing on benches. Speaking to Varsity at the CUSU rally, one student, Georgia Frimpong, expressed her belief that the pensions reforms “are one step in a long line of actions by the government to commercialise education”. Students hoping to stand in solidarity with striking academics are, however, conflicted over whether to sign the Change.org petition launched by Caius undergraduate Tamara Brian recently. The petition demands that the University of Cambridge compensate students £300 for lost contact hours from strike days. Some view the petition, which has reached over 600 signatures, as “putting [students] in a position of a consumer of a product,” as one student at the rally put it. However, many UCU members supported the idea. Speaking to Varsity, a picketer argued: “Students should take into account that education in this country has become ever more a commodity”, and viewed the petition as a way for students to “make their voices known”. Cambridge staff to strike tomorrow – how will students be affected? Speaking to Varsity, Yaqoob addressed the Union’s preliminary plans to strike into Easter term: “We think that the employers would have to be extraordinarily intransigent and hostile towards their own staff if they don’t come back to negotiate.” He added that a strike during exam term “really is the ultimate last resort”. The strikes are an attempt by the UCU to pressure universities to negotiate pension reforms proposed by UUK. The reforms involve the replacement of the defined benefit pension scheme with a defined contribution pension scheme for incomes under £55,000, a move which the UCU believes will make university staffs’ pension values riskier and less generous. The value of defined contribution schemes depends on returns from underlying investments rather than offering a guaranteed level of income upon retirement. The strikes will continue into Wednesday of next week. They will then resume on Monday 5th March and continue for two additional weeks, after a meeting on the 2nd March which is set to discuss universities’ response to the first wave of strikes.